I’ve always loved the idea of creating remote controlled and autonomous toys using Arduino. We’ve all loved and played with remote controlled cars as kids. As makers, I’m sure many of you will have dismantled, poked around in, and even upgraded your old R/C cars. Technology has come a long way recently, and tools like 3D printers and laser cutters are getting more and more affordable, allowing makers to design and build custom components. Couple these with an Arduino, and you have unlimited scope to create whatever you want. Someone who has taken this approach is Nicolas Roux. He can taken the idea of a standard remote control car, and replaced the wheels for tracks, improving traction and stability when off-road. Instead of using a normal remote to control the car, Nicolas has used an Arduino to control all the components from an Android smartphone. This unique Jeep design was created in the CAD software SolidWorks. 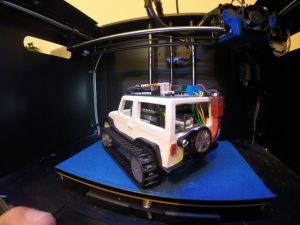 After a 10 hour print on his FlashForge Creator Pro 3D printer, he was able to assemble the car using an Arduino UNO, and an Arduino Motor Shield to drive the motors. An Android app called Bluetooth RC Controller is used to communicate with the car, and control the speed and direction (and headlights! ), all from a smartphone. Nicolas has released the model and instructions to download free from Thingiverse.